name 5 things. : New Door Hardware. It's not only a Monday, but the Monday after the time-change. Such a double whammy! Regardless, happy Monday! 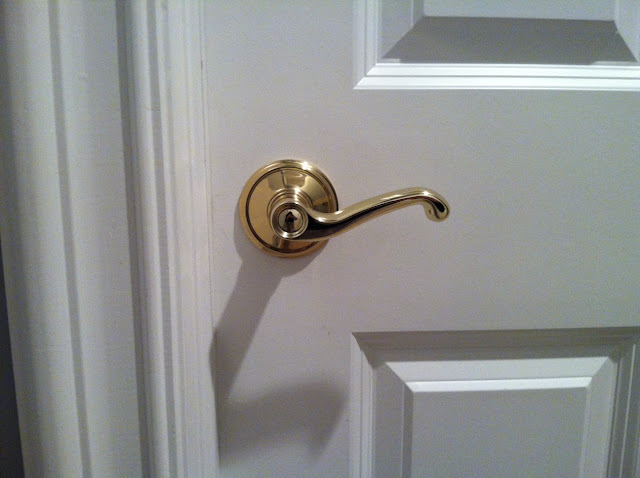 We had a fun-filled weekend installing some new door hardware around the house. To be fair, I installed the easy ones and Justin was in charge of the more complicated ones. Here's the fun that was waiting for us on Friday evening when we got home from work. This was the before situation on every dang door. It's not terrible, but those levers do nothing for me and the finish wasn't nice looking at all. Remember how I said that "good" brass is back? Well I mean it. Here's what our doors are adorned with now. It's the Emtek Turino lever in French Antique with the regular rosette. One of the things I've known since day one in this house is that I wanted crystal knobs on the master bath doors. Lucky for me, Emtek also offers beautiful crystal knobs and I could get them in the same finish with the same rosette as the levers. These are the Old Town knobs. When I woke up yesterday (the first day after we installed them), they were the first thing I saw and they brought an immediate smile to my face. And isn't that what decorating is all about -- making decisions that make you smile? In case you're curious, most of our other hardware (all faucets, kitchen hardware, etc.) are polished nickel. It doesn't bother me at all to mix finishes. In fact, I really like it. I love the warmth the brass brings to the table. The hardware is even more beautiful that what I thought it would be. In case you're in the market, I ordered them through Simpson's Hardware. They had the best price by far and the customer service was great. For the record, they don't know who I am; I just wanted to pass along the website in case anyone else is looking for new door hardware. Oh, and Emtek has no idea who I am either. I am just one very happy customer. Very nice! My MIL has beautiful antique glass knobs in her home. I told hubby I was going steal them someday. Gorgeous! I had shiny brass and just recently spray painted them ORB. I love the crystal knobs! Such a worthwhile upgrade! It really is all about the details. Those would make me smile too! LOVE! Who wouldn't smile after seeing those pretty crystal knobs? Door knobs are an essential part of a home. With one twist, we can feel safe inside. That's why it is important to make sure that they are always working in their best condition. The last thing we want to see after coming home from work is being robbed because of a faulty door knob. Thanks for sharing! Before you buy any hardware for your door, you need to think about the functioning and location of the door hardware. Lock sets are the most important part of any home's main entry door and need to be strongly built. In case your door latch or a lockset is broken, you need to immediately call an emergency locksmith as soon as possible. To keep your door knobs in perfect working condition , don't paint it by own because this can jam the locks due to the paint in it. Also, When your door knobs need repair or replacement , hire a specialized locksmith to repair it as this is related to security and for better security, you need the professional to replace it. Door knobs should be chosen carefully because nobody wants doorknobs that can easily be broken away by someone. A Professional Locksmith can help you in choosing a door knob and a well suited alarm system for the security of your family and the household products.